At this time of year, if you are in the northern hemisphere, try looking northeast at mid to late evening for two prominent constellations, Cassiopeia and Perseus. Learn these constellations now, and you may be able catch Comet Hartley 2 in front of Cassiopeia in late September and the first week in October. Then watch as the comet passes through Perseus until October 17. 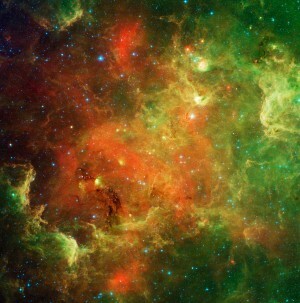 The easier to see will be Cassiopeia, which has a distinctive M or W shape, depending on what time of night you see it. It should be fairly easy to see, despite the moonlit glare during the evening hours tonight. This constellation represents a Queen in ancient mythology. Cassiopeia is easy to identify and so it is one of the most famous constellations in the sky. You will see it in the northeast by mid-evening tonight and earlier in the evening in the months to come. Perseus (the Hero) follows Cassiopeia across the night sky. In other words, as night passes, you will see them both ascending in the northeast — then arcing high in the north — then descending in the northwest — with Perseus following Cassiopeia all the while. Perseus is fainter than Cassiopeia and its stars are not so easy to identify. However, if you have a dark sky — like after midnight tonight — you will spot its graceful shape. Or wait till late September and the first week in October. Then, there will be no moon to obtrude on the evening sky. Both Perseus and Cassiopeia are considered to be “circumpolar” from northerly latitudes. In other words, as seen from northern parts of the U.S. and Canada, they never set below the horizon, but instead circle endlessly around Polaris, the North Star. 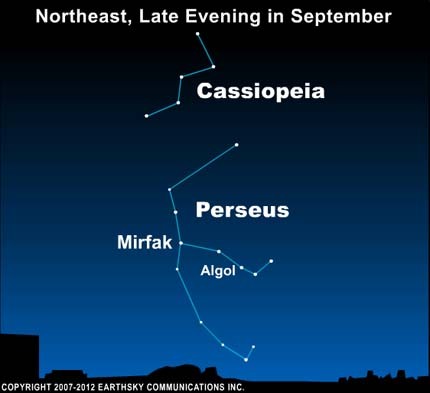 Look for Cassiopeia and Perseus in the northeastern evening sky for the next few months.